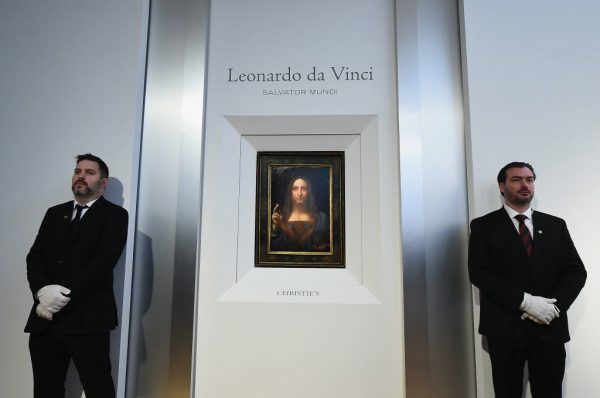 Leonardo da Vinci’s Salvator Mundi, which could sell for over $100mil., to be auctioned at Christie’s. Eight things to know about the painting. RIP: Holly Block (1958–2017). Bronx Museum launches fund in honor of Block. US government withdraws from UNESCO, creating profound implications for cultural institutions. Event at 356 S Mission cancelled due to protests from anti-gentrifiers. Photos comparing black people from Africa with continent’s wild animals pulled after accusations of racism. Philippe Méaille withdraws works he loaned to MACBA museum, citing concerns following independence vote. Omer Fast’s take on Chinatown at James Cohan Gallery angers community organizations. Charles Schulz’s home burns down in California fires. Harvey Weinstein never paid for $100k Cecily Brown work he bought at Planned Parenthood’s charity auction. Hollywood & Highland censors Erika Rothenberg sculpture in response to Weinstein scandal. Brazil arts institutions under attack following widespread criticism of a performance at MAM. The Massachusetts attorney general investigating deaccessioning of works by Berkshire Museum. Alfredo Jaar condemns CIA torture chambers as he unveils his “black site” installation in Yorkshire. Why there are so few great modern and contemporary art collections in Spain. James Whitely files $1mil. fraud claim against dealer Atam Sahamnian. Tensions mount between Artist Pension Trust and its contributing artists. State Street Global Advisors, orchestrator of Fearless Girl campaign, settles gender discrimination lawsuit. Market for Italian art may be running out of steam. Eberhard Kornfeld speaks to the media for the first time about Cornelius Gurlitt. Eli Broad retires from public life. John Oliver makes the case for tearing down Confederate monuments in the US. Locals fight to retain (a more durable) Eisenman fountain following Sculpture Projects Münster. Martin Roth exhibition to proceed at QM Gallery Al Riwaq despite partial blockade against Qatar. Alyson Baker to step down from her post as executive director of the Aldrich Contemporary Art Museum. Jonathan T.D. Neil on why galleries should adjust and balance to demands. Reappraisal of Ruth Asawa’s wire works, courtesy of David Zwirner Gallery. Auction houses finding new ways to survive. Mexico’s galleries working together to help each other recover after earthquake. City of Kassel is negotiating with Olu Oguibe to keep his monumental obelisk. Looted ancient marble bull’s head loaned to the Met to be returned to Lebanon. US returns 95 works from Edemar Cid Ferreira’s collection to Brazil. Gerhard Richter, Anish Kapoor, and Neo Rauch, make the list of Germany’s richest people. Five leading US scholars and curators pick the nation’s greatest memorial sculptures. Proceeds from sale of Basquiat’s Red Skull will fund new charter schools in New Jersey and Miami. 26 influential art world figures weigh in on whom the most influential artists of the last century are. Tristram Hunt calls for Exhibition Road to be fully pedestrianized after 11 injured in accident. New Museum selects Rem Koolhaas to design expansion on the Bowery. Christopher Knight reviews Giovanni Bellini: Landscapes of Faith in Renaissance Venice at the Getty. Beijing’s UCCA will now be a nonprofit run by director Phillips Tinari, after it was sold to investors. Tate St Ives’s cliffside extension set to boost local economy by £10.5mil. a year. Artnet looks at Frank Gehry-designed Guggenheim Bilbao, 20 years later. MFA Boston gets gifts of 17th-century Netherlandish art, with work by Rubens, Rembrandt, and van Dyck. ICP plans to move for the second time in two years. Smithsonian’s Archives of American Art acquires the records of Artists Talk on Art (ATOA). Two would-be rap museums in Harlem and in The Bronx are battling to become NY’s first. Barbara Kruger’s commission for Performa 17 announced. Alistair Hudson named director of the Whitworth and Manchester Art Gallery. Artnet asks Who Are the Most Influential Curators of the Last Century? Skowhegan School of Painting & Sculpture granted $250k by Helen Frankenthaler Foundation. Tim Schneider on why museums are at a disadvantage over private collectors and other issues. Superflex’s One Two Three Swing! at Tate Modern’s Turbine Hall. Artnet looks at Dalí/ Duchamp at London’s Royal Academy. Desert X returns in 2019. White Columns to move to new location next to Whitney Museum in New York. Stars of British art world donate works to Sotheby’s sale for Grenfell fire survivors. Emilie Volka joins Artcurial as the new director in Italy. Newhouse family appoints Tobias Meyer as representative for S.I. Newhouse Jr. art collection. Gary Nader to sell work from his collection during Art Basel Miami Beach in order to fund his museum. Artsy’s sales report for Frieze London and Frieze Masters. Kenny Schachter’s adventures in London during Frieze. Artnet interviews .Art domain founder Ulvi Kasimov. Artnet interviews Michael Sherman about moving from the mayor’s office to the auction house. Firstsite in Colchester, Essex to re-stage Hauser & Wirth’s fictional Bronze Age museum Frieze booth. Tracey Emin, Carl Freedman and Jonathan Viner to establish Margate arts district. Larry’s List interviews Hong Gyu Shin. Mary Weatherford now represented by Gagosian Gallery. Luhring Augustine now represents Oscar Tuazon. Judith Bernstein joins Paul Kasmin Gallery’s roster. Njideka Akunyili Crosby and Trevor Paglen among recipients of Macarthur Genius Grant. JR hosts picnic across US-Mexico border. Artnet writes about Adam Pendleton’s Black Dada. Jori Finkel interviews Judy Chicago. Ai Weiwei’s Good Fences Make Good Neighbors project deals with refugee crisis. NY Times reviews his Human Flow. Isa Genzken honored with Kaiserring 2017 award from the city of Goslar. Jeff Koons’ new Louis Vuitton Masters collection. Will Cotton’s annual drawing party. Seitu Jones and Richard Schlatter each took home a $200k grand prize at ArtPrize. Smartify app enables users to identify artworks and read about artwork by scanning them with smartphones. Six art gallery-worthy discoveries at New York Comic Con. Sarah Cascone chooses 18 things to see in New York. The Vinyl Factory interviews Justin Strauss. Ten artist-inspired or collaborated fashion collections. Categories: Art, Contemporary Art, Low Brow & Pop Surrealism, Overtime, Street & Urban Art. Tags: Contemporary Art, Features, Leonardo da Vinci, Low Brow & Pop Surrealism, Overtime, Street & Urban Art.